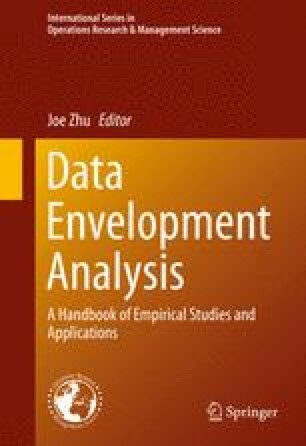 Data Envelopment Analysis (DEA) has traditionally been used to measure the performance of production systems in terms of efficiency in converting inputs into outputs. In this paper, we present a novel use of the two-stage network DEA to evaluate the sustainable product design performances. While sustainable product design has been considered as one of the most important practices for achieving sustainability, one challenge faced by decision makers in both the private and public sectors is how to deal with the difficult technical trade-offs between traditional and environmental attributes which require new design concepts and engineering specifications. To deal with this challenge, we conceptualize “design efficiency” as a key measurement of design performance in terms of how well multiple product specifications and attributes are combined in a product design that leads to lower environmental impacts or better environmental performances. A two-stage network DEA model is developed for sustainable design performance evaluation with an “industrial design module” and a “bio design module.” To demonstrate the applications of our DEA-based methodology, we use data of key engineering specifications, product attributes, and emissions performances in the vehicle emissions testing database published by the U.S. EPA to evaluate the sustainable design performances of different automobile manufacturers. Our test results show that sustainable design does not need to mean compromise between traditional and environmental attributes. Through addressing the interrelatedness of subsystems in product design, a firm can find the most efficient way to combine product specifications and attributes which leads to lower environmental impacts or better environmental performances. We also demonstrate how two-stage network DEA can be used to develop a analytical framework for evaluating sustainable design performances as well as to identify the most eco-efficient way to achieve better environmental performances through product design. 1.Department of Business AdministrationNational Taiwan UniversityTaipeiTaiwan, R.O.C.